Making a comeback from an injury as an athlete is hard. For some, just one can harshly affect your physicality and can take an even bigger toll on your mental approach. This is what senior track athlete Emmitt Wheatley had to overcome. It was March of 2017 and Wheatley had made a mark for himself. After a stellar freshman year and winning the 100-meter and 4×100-meter relay earlier in the meet, he prepared for his third race. One that would change his athletic career forever. A quarter of the way into the run, Wheatley tore his hamstring. The track star whose first year and a half was decorated with accolades and awards, had his season swiftly cut short. Over eight months, Wheatley did physical therapy four days a week, determined to build up his strength for his junior outdoor season. “It was really hard. When your ability as an athlete is taken away from you, it feels like you’ve lost your identity. Trying to overcome something of that magnitude you just feel like you want to give up,” Wheatley said. The native from Adair, Iowa returned to the track after eight long months ready to compete. Despite a lingering injury and an up and down indoor season, Wheatley helped lead the 4×200-meter relay team to its third straight conference championship. It looked as if things were beginning to move forward for Wheatley until his last indoor meet. Another torn hamstring. Another long eight months. During his senior year, head track and field coach Dave Cleveland noticed the struggle Wheatley was going through. Hoping to help, Cleveland tailored a practice plan specifically for him. “We tried a different approach this year. We changed his training in a way that built strength and confidence and helped him become part of the decision making process,” Cleveland said. Wheatley credits Cleveland as a huge factor in his recovery process during his senior season. Compared to his freshman year, Wheatley’s goals are very different. His aim has shifted from national championship stages to gradual improvement and constant success. So far that success has shown through the first outdoor meet. 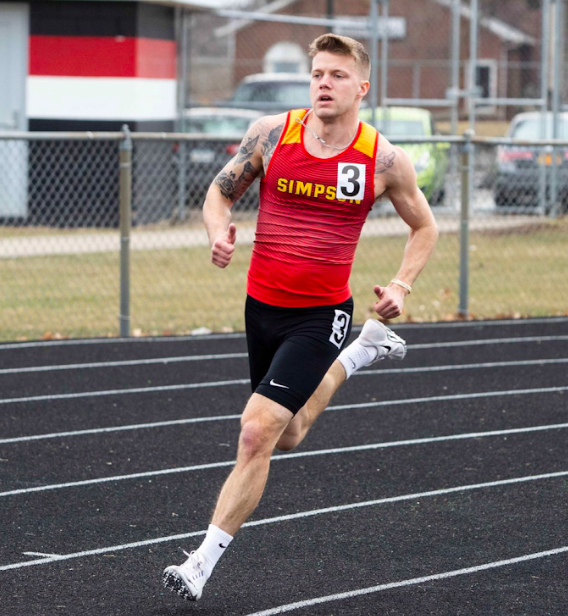 Wheatley was the leading runner for the Storm in the 400-meter dash, placing fourth at the Grand View Invitational. His teammates are confident in his efforts. Senior sprinter and 4×400-meter member Jordan Coughenour believes Wheatley can make a statement this outdoor season. Wheatley and the Simpson track team is set to compete at the Central Invitational, starting on April 5.